I always pack dosa varieties for Raksha’s lunch box and travel as it is her most favorite food. Usually I add poha / pressed rice or leftover cooked rice to make soft dosa that stays good for long time. Recently I came across this soft dosa batter recipe using raw rice (pacharisi in Tamil) and urad dal in Mallika Badrinath’s cook book. 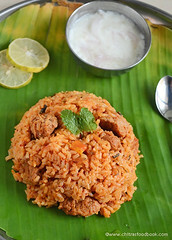 This recipe is without poha/aval, sabudana/javvarisi/sago or curd. Even though it looks similar to set dosa, ingredients of this soft dosa recipe is different from sponge dosa and set dosa. Its a very simple dosa recipe without using idli rice. You can also call it as raw rice dosa or pacharisi dosai. It can be prepared during Navratri and other fasting days to offer God. You can grind the batter in mixie or grinder as you wish. When I was young, my mom used to pack dosa and podi for school and college lunch box. She doesn’t even smear idli podi over the dosa to keep it soft. My mom just adds a tsp of sesame oil over the dosa. 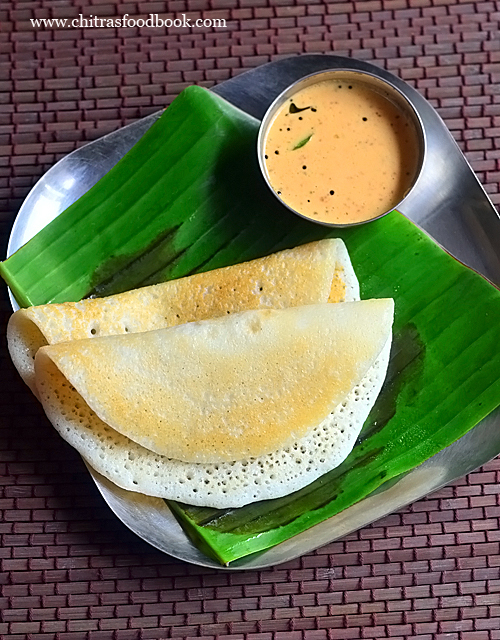 Still dosa stays soft and good till lunch time. When I tried this recipe, I reminded my mom’s dosa. Friends, if you want to pack this dosa for travel or lunch box, just follow the tips I have shared in this post. I am sure it will stay soft for hours. For variations, you can make it small in size, top this dosa with finely chopped onion, mixed vegetables or even add cheese if making for kids. If you like you can stuff it with potato masala as well. 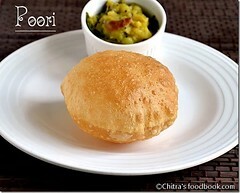 Ok, lets see how to make soft dosa batter at home with step by step pictures. How to make soft dosa batter recipe at home. 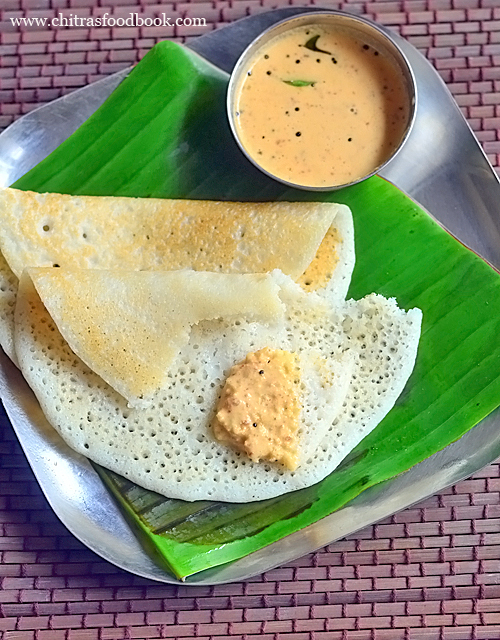 This dosa is prepared with raw rice and urad dal. It stays soft for hours. 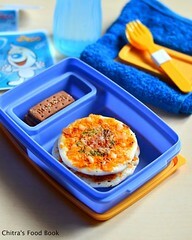 You can pack it for lunch box and travel. 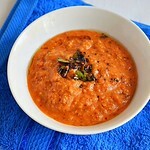 Wash and soak raw rice, urad dal and fenugreek seeds in a bowl for 3 to 4 hours. Grind to a smooth batter in a mixie or grinder. Transfer to a bowl. Let it ferment overnight. Batter will rise. The next morning, add salt and mix well. Make thick dosa. Drizzle oil over the dosa and cook one side. Flip it and cook the other side. Sprinkle few drops of water over the dosa to make it soft. Remove and keep it in a plate. Make the second dosa in the same way and stack it. Cover with a plate. 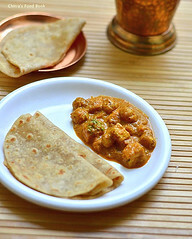 Pack in a lunch box or for travel after dosa becomes warm. 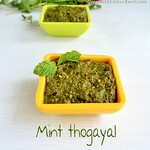 Serve with idli podi or any chutney. Wash and soak raw rice/ Pacharisi, Urad dal, Fenugreek seeds together for 4 hours. Grind to a smooth batter using grinder or mixie in batches. (Use ice cold water for grinding if using mixie). No need to add salt. Collect the batter in a bowl. Let it ferment over night or for 12 hours (timings vary during winter season). Batter will rise. The next morning, add the required salt, mix well. 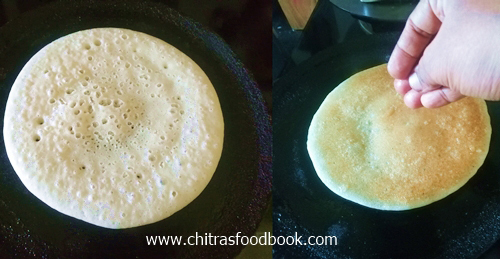 If the batter is too thick, add little water to bring dosa batter consistency. Heat a dosa pan and sprinkle some water. It should sound ssshh. Then lower the flame completely and wipe the dosa pan with a cloth. Now pour a ladleful of batter. Spread it slightly and make thick or medium thick dosa as you like. Now increase the flame to medium. Bubbles will appear all over the dosa. 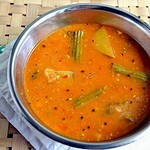 Then drizzle a tsp of oil around the dosa and cook for a minute. Flip the dosa and cook the other side. Before removing the dosa from the pan, sprinkle few drops of water all over the dosa. It helps to keep the dosa for long time. 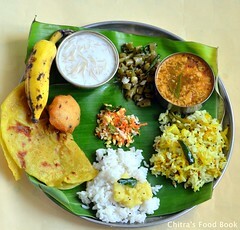 Remove the dosa from the pan and keep it on a plate or banana leaf. Make the other dosa in the same way. Stack all the dosa one over the other if you are packing for travel or lunch box. Cover with a plate to prevent drying. 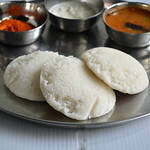 Enjoy eating hot immediately OR You can pack the dosa and idli podi/chutney in separate boxes. You can also smear idli podi mixed with oil all over the dosa and pack in a box. I tried making crispy, thin dosa too. It came out well. 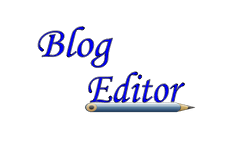 Methi seeds is optional. But I used it for nice flavor. You can soak rice and dal separately. Grind them separately and mix both the batter. Cooking soda is not needed. If you are consuming the dosa immediately, you don’t have to sprinkle water over the dosa while cooking. 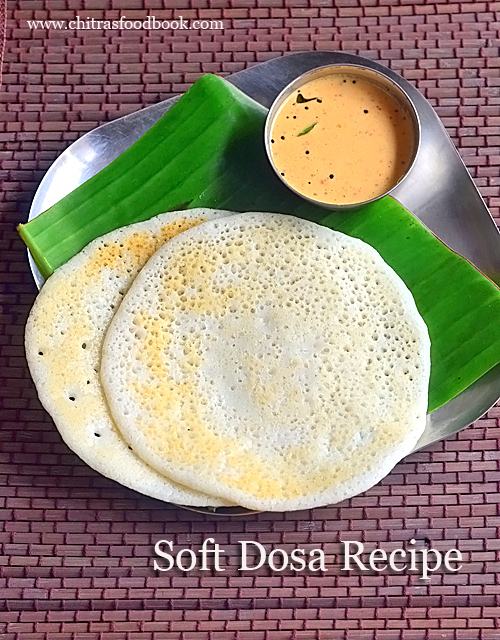 Try this super soft dosa recipe and enjoy with your favorite chutney or idli podi ! I served it with pottukadalai chutney.